Today, a dip at a palm-lined beach, a short hike and a small shopping trip are on the cards. You will wander through old tombs in the oak woods of Armeni and wade through a cold river in a palm grove, experience the curious museum of a priest in a mountain village, visit an abandoned monastery of great historical value and rest by a stream spanned by a very photogenic Ottoman bridge. Be sure to bring shoes with a firm grip, enough sun cream and your bathing costume. From Georgioupolis, first head down the National Road as far as Rethymno. Leave the highway at the city's second exit, signposted as 'Spili', and turn off into the mountains. Just after the first pass summit and before you reach Spili village, follow the brown sign on your right to the 'Late Minoan Cemetery of Armenon/Armeni'. The Late Minoan Cemetery of Armeni is open daily from 10am - 6 pm (admission: 3 euros). Archaeology unites with a stunning experience in nature here in a large, Mediterranean oak forest. The Late Minoan Cemetery of Armeni is one of the most beautiful archaeological sites on the island. Over 230 graves from the period between 1400-1200 B.C. are hewn into the rock face here, lying closely packed in an extensive forest of Valonia and kermes oak. The locals call this area 'Prinokephalo' which means 'hill of the wild oaks'. The whole compound is fenced off. You can visit Tuesdays to Sundays, from 10 am to 6 pm (November-March, 8 am - 3 pm). You neeed around 40-50 minutes for a leisurely walk around. The cemetery was only discovered by coincidence in 1969, and the city it belonged to remains undiscovered to this day. Archaeologists found over 500 skeletons in the graves. Studies revealed that the men reached an average age of 28-31 years, and the women only lived to be 20-25. All of the graves were family graves. The dead were either interred on the rock floor, in large ceramic jars (Pithoi) or in painted sarcophagi made of clay or wood. People laid weapons and jewellery, clay vessels and tools beside their relatives to accompany them on the journey to the afterlife. Today, some of these finds are held in the Archaeological Museums in Rethymno and Chania. The graves differ in size due to non-negligible social differences. They all consist of a burial chamber hewn into the rock, with an entrance passage sloping diagonally down, a dromos. These dromoi are of differing length: the longest is 16 m long with 24 steps. There are also considerable differences between the chamber tombs. The largest is approximately 2.4 m high and 5x5m wide, and surrounded by a stone bench. Today, this burial chamber has electric light. In front of the entrance to each chamber tomb, the stone that would have been rolled across the grave is leant against the rock wall in most cases, on the side wall of the dromos. Afterwards, continue along the street towards Spili, and in April/May you will pass by fields blossoming with giant fennel. It's worth stopping for a photo of large, blue sign, which is uniquely illegible in its completeness: it designates 24 villages in a distance of 4-34 km. You simply have to pull over to study the sign - or ignore it, as the road service probably just made a concession to some over-eager local politician. 10 km after Armeni, a road then turns off to the right towards Preveli and Plakias. It takes you through the village of Koxare , and then enters the Kourtaliatiko Gorge, which is 3 km in length and particularly impressive at its opening. To your right, you will see Agia Kyriaki, a small chapel built into the rock and well worth stopping by. 900 m further, steps take you down to the chapel of Agios Nikolaos in five minutes. From there, you have a great view of the opposite wall of the gorge, where Mesopotamos has its source, the brook that flows into the sea on Preveli beach. The next village is called Asomatos, which means 'angel' or 'incorporeal one'. The pottery workshop 'Ydria' is situated on the way into the village. Several signs point to the Museum of Papa Michalis at the centre of the village (open daily, admission 3.50 euros). It is named after Papa Michalis Georgioulakis (1921-2008), who was once the village priest and hoarded everything he could lay his hands on during his life. He didn't just collect what the villagers wanted to throw away, but also visited flea markets across the whole country, pulled off the boots of dead soldiers and partisans, or took their identification tags. In this way, his family's large home turned into a museum, where today his son, his German daughter-in-law, or a French friend of the family give guided tours. Recently, they even opened a small kafenio in the museum. At the end of Asomatos village, a street branches off down to the left, taking you to Preveli. You can visit an Ottoman bridge and two monasteries there, but above all you can hike down in about 30 minutes from a large car park to the palm-lined Preveli Beach. Preveli is one of the most significant daytrip destinations on the south coast of Crete. The name stands for a unique beach and a wild canyon, where hundreds of palm trees line the shore of a tumultuous mountain brook. But Preveli also includes a romantic ruined monastery and an intact monastery of historical significance, an old Ottoman bridge, a secluded taverna by the river and a modern memorial to the Second World War. Preveli is also known for hiking and swimming - which adds up to a very active day. After an enjoyable time in Preveli, you can then drive back up to Asomatos and turn off left there towards Myrthios. Here, you can take a break in one of several panoramic tavernas and enjoy a fantastic view down over the seaside resort of Plakias. Two neighbouring shops on the opposite side of the street are worth a visit. In 'Lithos', Sifis Petrakis showcases works by select jewellery designers from all over Greece. In 'Carolas Workshop' Carola Poppinga awaits you. Born in the small East Frisian town of Norden, she makes her own fashion jewellery from nickel silver and octopuses in varying sizes as wall decorations. 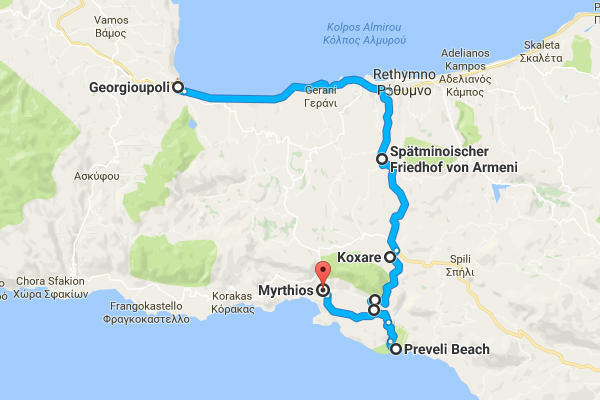 From Myrthios, now follow the street through the Kotsifou Gorge, about 500 m long with steep walls over 500 m high, and you will be back in Georgioupolis about 40 minutes later.